Calling all Mississauga youth! 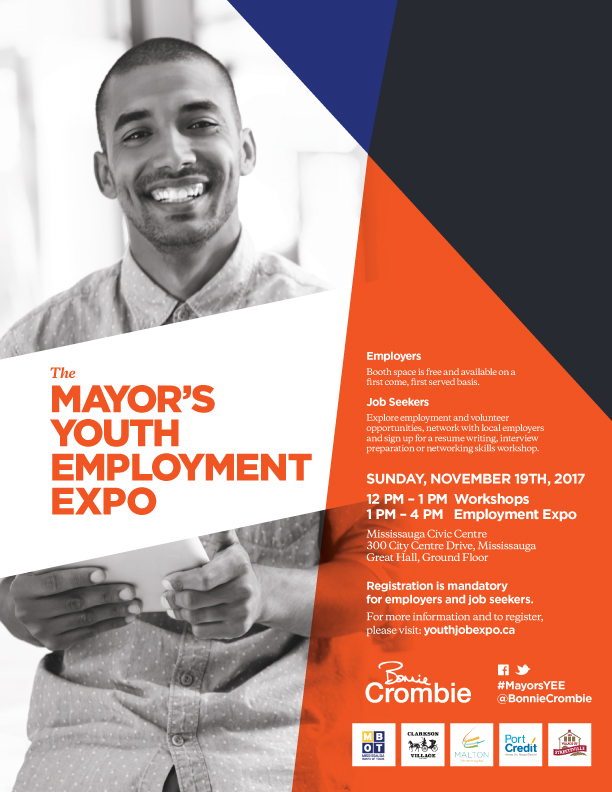 The Mayor’s Youth Employment Expo 2017 will be held from 1pm to 4pm on Sunday, November 19th, 2017 at Mississauga City Hall. Youth job seekers will have the opportunity to explore employment and volunteer opportunities, network with local employers and improve resume writing and interview skills. Last year was a resounding success thanks to businesses and organizations who took part to create mutual connections with talented youth in search of opportunity. We hope to come back even bigger and better this year with the same simple goal – creating mutually beneficial connections between talented youth in search of employment and local businesses and organizations in need of talented youth. New this year, LinkedIn will be leading interview skills building workshop from 12pm to 1pm before the Expo. Magnet and the Centre for Education & Training will also be leading resume writing and skills building workshops. To register, please visit youthjobexpo.ca or contact the Mayor’s Office at mayor@mississauga.ca or by phone at 905-896-5555. I look forward to welcoming you to the 2017 Mayor’s Youth Employment Expo – don’t forget to bring your resume! This entry was posted in Mayor’s Youth Jobs Initiative, News, The Crombie Column. Bookmark the permalink.